"How will Batman ever get out of this one?" That's an easy question to ask, and an even easier one to answer. Well, he's Batman. He can get out of anything. There's always something the villain didn't account for, something they missed, that Batman can exploit. But what if the villain is Batman? What if this villain thought of something our Batman didn't? That's the central question of this issue to me, and the subversion of the usual overpowered Batman provides us with a surprisingly terrifying story. This book is gorgeous. Jock and David Baron manage to create a beautifully vibrant and creepy-looking book. There's some great expression and shadow work on the part of Jock here, which worked for me because this was one of the more emotionally-charged issues of the series so far. The stakes are high and character dynamics are being tested, and Jock's pacing of certain scenes like the first page and a conflict between Bruce and Alfred came across very strong and emotionally. His use of smaller panels to control the pace of the scene, coupled with Baron's amazing colouring work, gives us the best-looking issue of the series yet. Sal Cipriano does some incredible work here, weaving the story itself into the lettering by playing with font and balloon colours. Scott Snyder is keeping this series very thematically rich and each issue feels so full of character. As we move through the story, Batman loses more and more of himself. He thinks he knows himself more than anyone else, but this is proven wrong by the Batman Who Laughs. 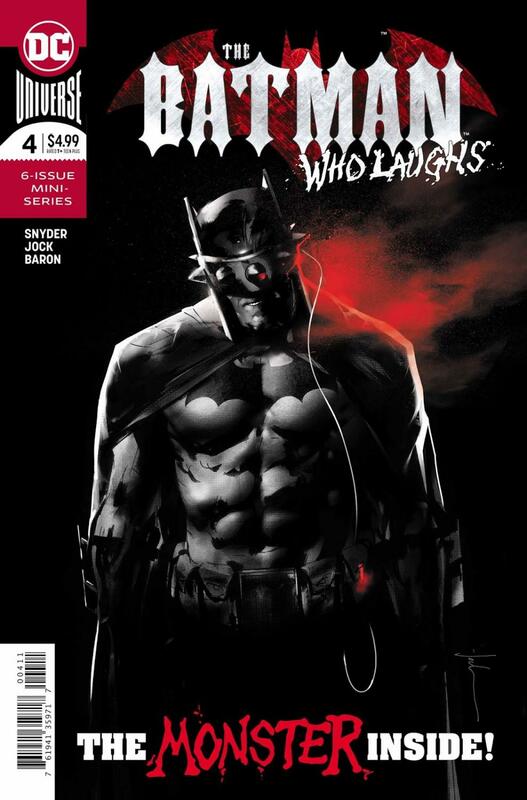 In order to try to defeat this villain, Batman needs act less like himself and more like the Batman Who Laughs, which adds some rich drama to the scenes. A conversation and then fight between Batman and Alfred comes across as very emotionally distressing as throughout Snyder's entire run on the character, he has built this wonderful relationship between the two. It's more than a father and son relationship, it's something somehow even more personal than that. They rely on each other in a way that they don't realise, and Alfred watching Bruce slowly lose himself is so genuinely heartbreaking in a way that feels earned. Snyder has mixed his recent cosmic storytelling sensibilities with his horror roots, which is an unexpected combination. This work is fantastic, and the art by Jock and David Baron elevates the plot.